This work follows in many ways that performed for the adsorption of CO on Cu(001) . Yet, it opened a wealth of new insights about the way we characterize CO adsorption. The interest on CO adsorption on Ag surfaces lies on the ability of Ag(110) to catalyze the formation of CO2 and CO3 from O2 and CO reactants at temperatures low enough (~100 K) to preserve oxygen in its molecular form. The above process stands out since current commercial catalysts for oxidizing CO produced by incomplete combustion, which are based on platinum-group metals and designed for dissociative chemisorption of O2, need to operate at temperatures well above room temperature to catalyze the reaction efficaciously. The CO oxidation rate of Ag surfaces, however, turned out to depend strongly on the crystallography of the surface since the production of CO2 on Ag(001) is considerably lower than on Ag(110). The issue thus turned the attention on whether O-driven reconstruction of the Ag(110), presence of subsurface oxygen species, or surface defects would explain the contrastive behavior between the above two surfaces. What is more, the nature of CO adsorption on Ag surfaces — whether it is by physisorption or chemisorption — has been by itself a matter of discussion. On the one hand, CO has a very low sticking probability on Ag(001) even below 100 K. On the other hand, even for Ag(111) and Ag(110), the measured heat of adsorption at temperatures between 50-150~K is only 0.28 and 0.24 eV, respectively. Along these lines, one may turn to the characteristic energy losses in exciting the vibrational modes of the adsorbed species since these are an essential source of information concerning the presence of adsorbates. The frequencies of such vibrations likewise fingerprint the interaction between the molecular and the surface orbitals. Atop strong chemisorption, for example, is characterized by a 10-20 meV softening of the C-O stretch mode in the gas phase (266~meV) and a metal-CO stretch mode frequency of the order of 50-60 meV. In this regard, however, the experimental evidence for CO/Ag(001) is rather inconclusive. Namely, identification of adsorbed CO — attained via high resolution electron energy loss spectroscopy (HREELS) — was based on two features in HREEL spectra at 256 meV and 51 meV associated to the C-O stretch (n1) and the Ag-CO (n2) stretch modes, respectively. Such values, however, are distinctive of strong chemisorption rather than of weak chemisorption, as ascribed by Burghaus et al. Measurements of the frustrated rotation (FR or ν3), the frustrated translation (FT or ν4), and the substrate modes of CO on Ag(001) have not been reported in the literature. To our knowledge (2009), the only pieces of information about the former mode had been attained by Hahn and Ho on Ag(110), 20 meV and Wallis et al. on single Ag atoms on NiAl(110), 26~meV via inelastic electron tunneling spectroscopy with scanning tunneling microscopy (STM-IETS). 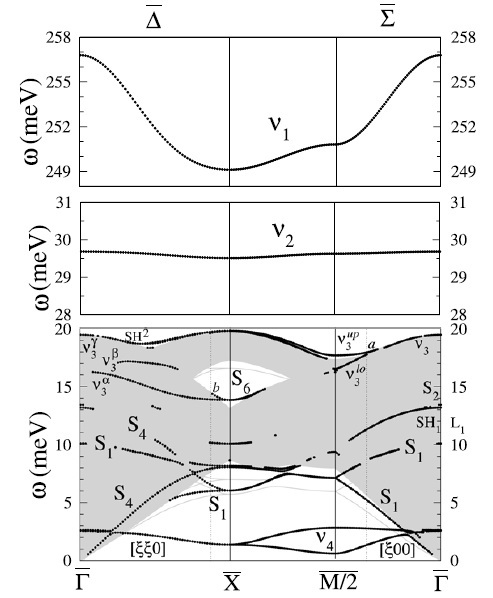 In this regard, it is interesting to note that, should the FR mode be as low as 20 meV, one may expect a significant dynamical coupling with the substrate modes. Yet, the calculations by Lorente et al. do not support the latter prediction since their calculated frequencies of the FR on Ag(110) are ~29 and ~26 meV, nor quite coincide the measurements on Ag(001) regarding ν1 and ν2 as they have obtained ~262 meV and ~33 meV, respectively. Furthermore, there is another issue to understand. On Cu(001), which has been tagged by CO weak chemisorption, we have seen that the C-O stretch mode disperses by 10 meV, as well as the FR and FT. These findings readily indicate that the molecules interact among themselves. Where is this interaction coming from? It could be a direct interaction between the molecules whose strength is dictated by their distances or an indirect interaction via the substrate. The former hypothesis is not very plausible since the molecules are relatively far (3.6 A) from each other. But, naively, nor is the second one since, at the same time, the Cu-CO stretch mode do not disperses. Notice that, provided that CO is chemisorbed, both vibrations perturb the metal-molecule charge redistribution that creates the Cu-CO bond and softens the C-O bond and the Cu-Cu bonds. 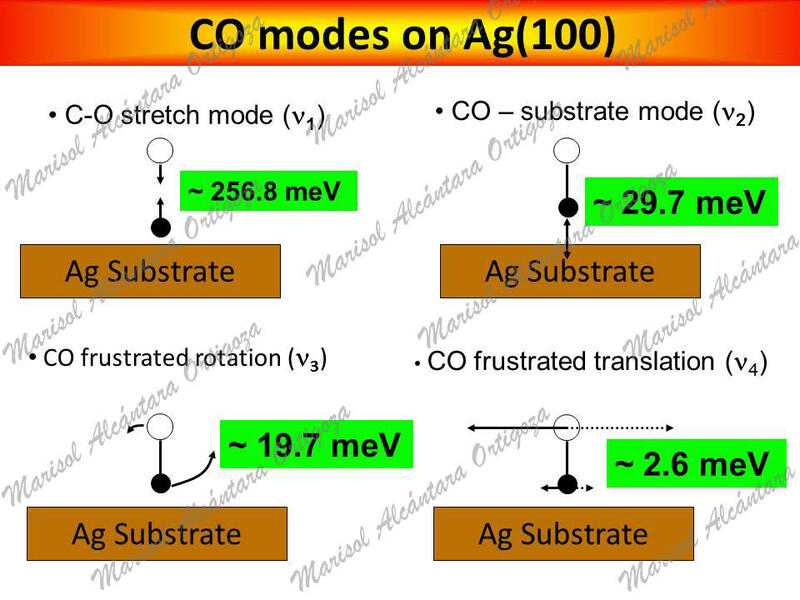 Now, on Ag(001), if CO is so weakly bond — even in the limits of physisorption, not only should one expect the C-O stretch mode to be almost unperturbed, but also the dispersion to be washed out. Calculated-ν2 DOES NOT match the HREELS loss peak. Despite the low binding energy, CO has strong effect on Ag surface modes.